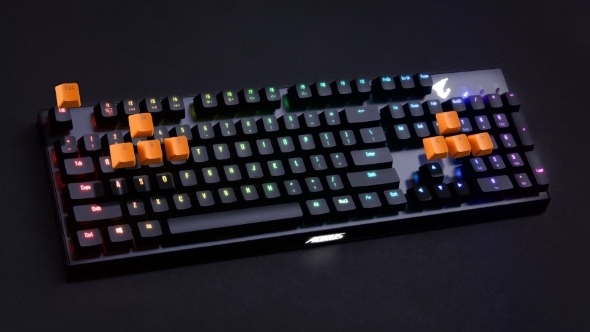 There’s something different about Gigabyte’s Aorus K9 mechanical keyboard. Sorry, despite the name, it’s not a robot dog with issues climbing stairs and a penchant for extreme violence. No, it’s something else. The Aorus K9 comes with Flaretech optical switches slotted into its glowing frame giving it a mechanical switch design with tons of potential. It’s time to go mechanical. Here are the best gaming keyboards around. Optical switches are fantastic… not sold on them yet? A little trust goes a long way, but here is the basic pitch, anyways. These switches offer the same responsive feedback that we’ve come to expect from mechanical switches, but rather than utilising a physical electrical contact to measure key depressions, optical switches use light, like your mouse. Through a light-sensitive sensor on the PCB, these switches measure the keys’ positions and report it back to your PC. This has a few benefits over a regular mechanical design. Firstly, it’s more reliable as no physical contact occurs between the sensor and the electrical components that pass the signal on. 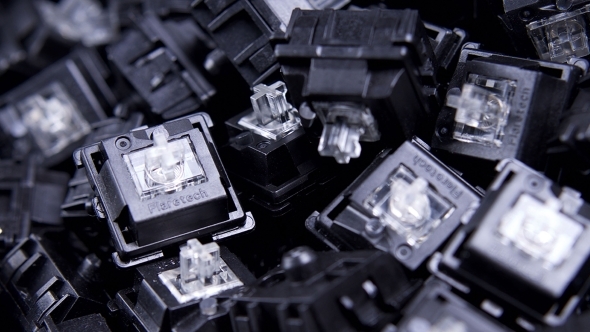 Less contact, means less wear and tear over time, and subsequently leads to a 100 million keystroke reliability for the Flaretech switches. Cherry MX switches, the most common mechanical switches, offer a 50 million keystroke lifetime by comparison. Secondly, these switches are swappable. You don’t need to start soldering to swap from tactile to linear. Just pop the key cap off and then use the reverse of the same tool to pull the switch straight out. Thirdly, they are somewhat resistant to water. So long as the PCB is well-insulated from outside elements, it really won’t make a huge difference whether you spill [insert popular branded drink here] all over it. Fourthly – I promise this is the final point – these switches offer some degree of programmability. Wooting created their Wooting One to utilise the same Flaretech switches, and coded fully analog switches into their program, allowing for more positions for the key to be in rather than just a binary on or off state. Gigabyte seemingly haven’t taken this same route with the K9, but it’s another potential feather in the optical cap depending on the switch design. But yes, sorry, back to the actual Aorus K9. Gigabyte have included full RGB LED lighting – obviously – and have started off with a fairly minimal full keyboard design. 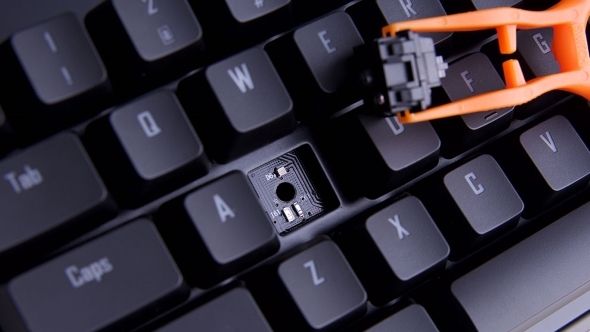 Durability seems to be the name of the game here, as not only are the optical switches long-lasting, but Gigabyte have included nine orange PBT keycaps for the FPS gamer’s usual suspects, and included a braided cable too. We’re still patiently waiting on pricing for the Gigabyte Aorus K9. It will be interesting to see whether the minimal keyboard design can outweigh the cost of the optical switches and PCB to make for a competitively priced keyboard. Gigabyte aren’t the only ones tempted by lightspeed switches, however, as Razer have been supposedly toying with the idea of an optical design with their Razer Purple switch. Rumour has it that Razer were showing off their imminent optical gaming keyboard at CES last week too – that’s a full gaming board using their new switches and sporting an expected $200 price tag. Watch this space – it’s looking like optical has a bright future ahead of it in 2018.